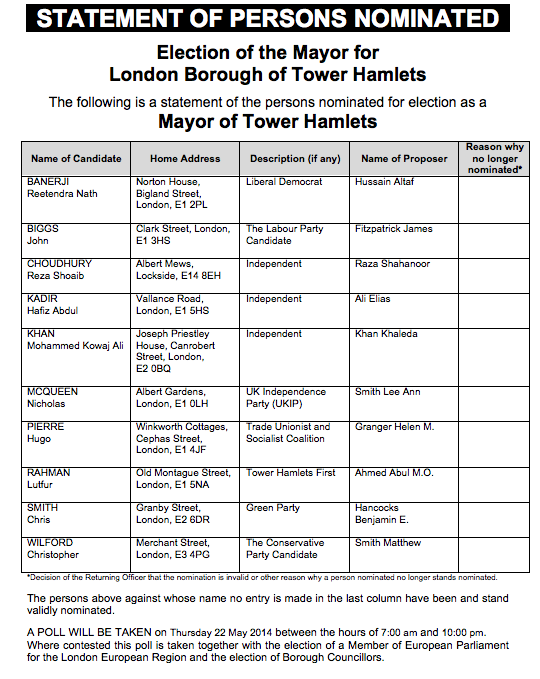 I’ll update this blog post as and when I get more information but here’s the official list of candidates for Tower Hamlets mayor. It was announced today and it includes 10 names, all of them male. Reeten Banerji, 32, is a maths teacher and Territorial Army member, serving in a Hayes based logistics regiment. He was born and has lived most of his life in the London Borough of Hounslow. Reeten’s professional career, before teaching, had been with a major US telecommunications corporation in Atlanta, Georgia. He then moved into IT consultancy in Silicon Valley, California during the ‘dotcom’ years. He worked with a number of IT startup companies launching wireless Data Network products and services. Reeten holds a Bachelors degree in Mathematics from London and an MBA from the University of North Carolina. He is a keen cyclist and is involved with the London Cycling Campaign helping to bring about the best possible services for people who cycle or who want to cycle in London. 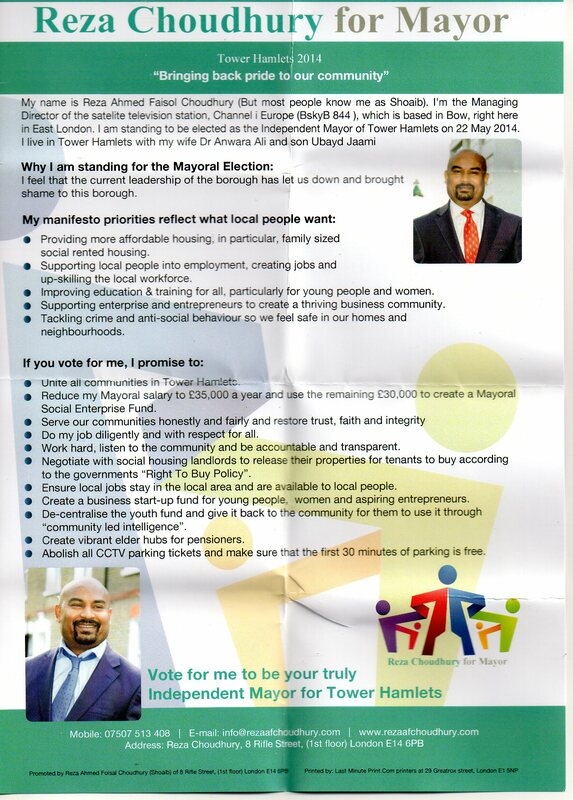 He sounds far too sensible for Tower Hamlets but I hope he does well. Good luck to him. The other name to strike out is Reza Shoaib Choudhury, who is standing as an independent. He is not so unknown in Tower Hamlets. In fact, he’s very well known, and popular. He is married to the lovely and lively Dr Anwara Ali, who was formerly a Labour councillor in Bow West before she defected to the Tories in 2010. Shoaib is the boss of the Bengali satellite TV station, Channel i, so that’s one channel Lutfur will struggle to bring round to his ways. In fact, there’s an expectation that Shoaib could split the Bengali vote from Lutfur. Well, let’s see. The nominations for council candidates have also been published but I’ll leave that for another post. Labour Mayoral hopeful John Biggs was facing mounting criticism today on his questionable record on race issues as a leaked internal memo from the Labour Party revealed that concerns had been raised regarding Mr Biggs’s apparent prejudice as early as 1995. “In short, I would accuse John Biggs of racism” after Biggs was apparently involved in the production of an inflammatory election leaflet. This is not the first time Biggs has been mired in a race row. In 1998 he campaigned against the creation of Banglatown to be added to Spitalfields Ward, and in 2013 his Labour Group made false claims that housing allocations were being targeted to Mayor Lutfur Rahman’s supporters – claims that were gleefully used as propaganda by the EDL. Recently, Biggs caused controversy with irresponsible remarks on the Sunday Politics show claiming Mayor Rahman was only serving the Bangladeshi community, at a time when the EDL were planning to march through Tower Hamlets. I’ve asked Lutfur’s camp to produce the leaflet that was at the centre of the row between Michael and John, but they say they don’t have it. Context is everything, so let me try and give some. If you thought politics in Tower Hamlets was poisonous now, it was a different matter in the Nineties. The characters now act like dim kids in a playground; back then it was proper adult hooliganism. Race and racism was genuinely the major issue then. Derek Beackon had been elected as BNP councillor in Millwall in 1993 and was kicked out a year later. The Lib Dems were at the centre of an inquiry by their own party leader, Paddy Ashdown, who was deeply concerned that activists had been engaged in racist campaigning. Pretty much everything was evaluated in terms of race. As now, back then it was also used as a political stick. We don’t have the leaflet, so we can’t evaluate it, but my understanding is that Michael Keith is appalled that something taken completely out of context 20 years ago is being used now as a smear. I’m sure we could all look back at things we’ve said 20 years ago and wish we’d phrased differently. I’m also sure Alibor will look back at his own behaviour now in 20 years and feel disgust with himself. I understand Michael Keith might be issuing a statement on this today. My understanding is there was no way he thought John racist, either then or now. In fact, he is one of the people who has signed John’s nomination papers. As for Alibor’s complaint to the Equalities and Human Rights Commission…well, what he doesn’t disclose is that they’ve told him it’s not one for them. The EHCR has in fact written to him twice to warn him against using misconstruing any of their replies to him on the matter. If he feels so strongly about John’s words on the BBC Politics programme (when he pointed out that Lutfur’s cabinet was exclusively Bengali and appeared to be focusing too much on one section of the community – a statement of fact and fair comment, actually), then he has the option of going to the police. But he won’t because even he would know that’d be wasting police time. After all, the police have drug dealers and gang members to catch on Alibor’s Ocean estate, don’t they. However, back to Lutfur’s press release. I asked John for his thoughts. There are two camps on how to react to these attacks. One wants him to ignore them, the other wants him to punch back. His statement to me below is measured and dignified in my view and straddles both camps. This endless mud slinging and negative messaging demeans the mayor and shows both a desperation and that he has given up trying to reach across the borough and is working a ‘core vote ‘ strategy in which he clearly hopes that most people will stay at home and that his supporters, galvanised by repeated spurious allegations against me will get them back into the town hall. There is of course a danger it will work but it shows that their cupboard is pretty bare. The repeated use of the racism smear both insults real victims and diminishes them. I am proud of my record attacking intolerance. Ironically they are defining themselves as the next obstacle to the sort of tolerant community we need. It helps me to understand quite how important it is to defeat them. I hear they are announcing their manifesto today. It will be interesting to see how many of our policies they will steal! To dredge up out of context comments that were made almost twenty years ago to smear someone’s character scrapes the gutter. I’ve known John Biggs for decades and, while we have had our differences at times, there is no doubt in my mind that he works for the benefit of the whole community in Tower Hamlets. To try to paint him as a racist is a cynical act of electoral dirty politics. He is the best candidate to represent all the communities of the borough in these difficult times and I am happy to support him.